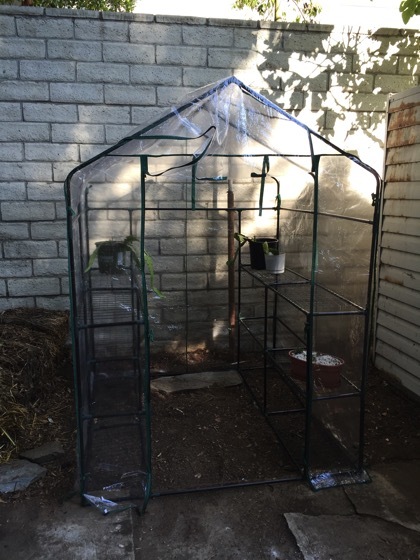 I saw mention of this small, walk-in greenhouse from Big Lots on another garden blog — I am so sorry, but I don’t remember which. If anyone knows, please share it with me so I can link — and it caught my eye as I had been thinking of buying something like this for my garden. Here in sunny, Southern California, I don’t really need it for the extra heat (although it might come in handy during our 1-2 frost warnings each winter), but I do need something to provide some basic protection from the roaming wildlife that regularly visit my garden. Although I live in urban Los Angeles, I get nightly visits from opossum, raccoons, squirrels and all sorts of birds. As much as I love the wildlife, they can do some damage to any young or small plants that I might have on my potting bench, including seedlings, cuttings or simply something that interests them. Too often I come out in the morning to find pots, tipped over, dug up and, even in the case of some ceramic pots, broken on the ground. I have found that even slight deterrence seems to work with the animals. For my container garden, I usually just surround the pot with a but of hardware cloth until the plants grow large enough and it seems to gently cause them to go elsewhere. 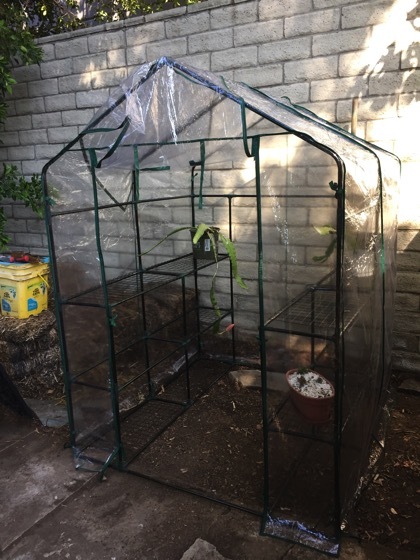 This greenhouse isn’t entirely sealed along the bottom edge, but I think it will provide just enough of a barrier to allow my seedings to grow and be potted on without being knocked over. 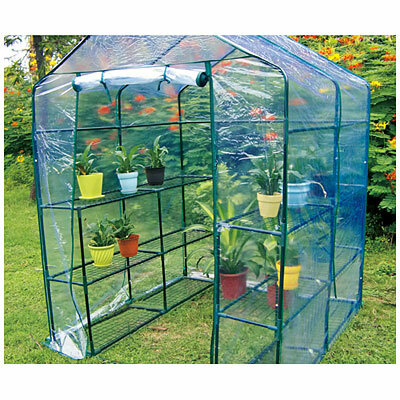 This little greenhouse was on sale this weekend at Big Lots for $50 — about $20 off. Now, I know as well as you that cheap, Chinese-made, products aren’t the most robust in their design and materials, but I figured it would be good enough for my purposes if I treated it gently. I was pleasantly surprised to find that there were no missing parts (something that has caught me out in the past with other “assembly-required” products) and the material used were of reasonable quality. The visual directions were clear and unambiguous and the entire unit went together in about 1.5 hours. The wire shelves are thin wire and not attached to the piping on each level, but rather just sit on them, so we added some ties to hold them to pipes, just to prevent knocking them off as we moved pots around. You could easily add your own shelving materials if you wanted something a bit stronger. I am also thinking of laying some landscape cloth on the bottom and covering it with a couple bags of stone — or some extra flagstones I have — so that the floor doesn’t get muddy when watering. Overall, I am pretty happy with the unit right now and look forward to seeing how it helps my plant propagation in the future. Categorized under: Build/Make, DIY, Equipment, hardware, Nature/Outdoors, Products, Projects.